Hopefully it won't be as disappointing as I found the other Superman movies. The Dark Knight was pretty good, and I hope that same goodness appears in this. But what about Nicolas Cage's son, Kal-El? Anyhow, I really liked Superman Returns, but what they're doing sounds like a good move anyway. I don't think you can make a good movie about Superman. It just doesn't feel like a kind of hero you could make a good movie about. Then again, I've always hated Superman. How can a guy with almost no weakness constantly get surprised when the villain pulls out kryptonite for the 100th time? Read All Star Superman. That should be all they need. They can tweak the ending a bit, and if they really want they can wedge the current Superman arc, or Final Crisis in there. But Grant Morrison is all they need. I'm Wary about Goyer; he has made some very bad things as well as some good ones. DC's President Diane Nelson came out and said that Nolan was/is not involved with the Superman reboot, it was nothing more than a rumor. I liked Superman Returns, but I don't think I could handle another Superman Returns. It really only worked if you considered how long it had been since we had a Superman movie. 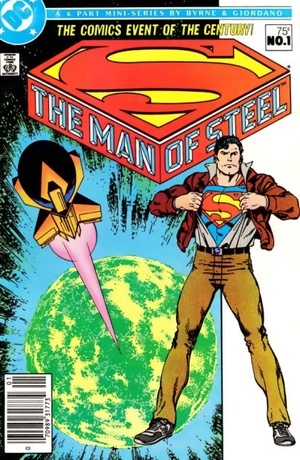 Now, I've never read an actual Superman comic in my life, but...I think there's enough Superman out there to get a pretty damn good impression of the man of steel. And quite frankly, I really don't think he has a third dimension. Creating any kind of script to give Superman any kind of depth should be grounds for a nomination to sainthood because that would be a dolphin-humpin' miracle. You're right about what? All you said is "Read All Star Superman". That's not being right, that's just saying stuff. More Lex Luthor? Superman does have other enemies, they do know this don't they? I used to think the same think about Superman... and then I read The Death of Superman and all the stuff that came afterwards. That was pretty much the best super hero comic I have ever read. I can see Superman in a good movie, and I hope he finally gets one. As I said many o' times, it'd be a damned shame that they wouldn't go on in the Reeve superman universe. It's not like comics don't change in style all the time. I think this could be good news, and hopefully lead to a well done Superman flick. I personally was a bit underwhelmed with Superman Returns. Kevin Spacey was a great choice for Luthor but he was given nothing to work with and had possibly the dumbest plan I'd ever heard of from a movie villain. No one would have wanted to live on that island. Plus maybe this time around they'll cast someone as Superman who doesn't look like a teenager. Not saying Mr. Routh did a terrible job... he just didn't look the part to me. The only hiring news that can excite me is Bruce Timm/Paul Dini. being brought on as a writer, director, or consultant. Good news, might actually make a good film this time. Although, I'm slightly saddened by Brandon Routh not being in it, I thought he did quite a good job. For this Hubilub, you have shown your true colors, and are therefore not worthy of your Escapist forums fame! Geez. Seriously man! I did'nt expect you of all people to have such an antiquated and misinformed picture about anything! Then again, since I'm pretty sure your an Anime/Manga fan, and misinformations and antiquation are part of what drives most of you, I can't say I was completely taken off guard, but damn! This is a shock strong enough to kill the man of steel! Read it you'll know what I'm talking about. I used to think the same think about Superman... and then I read The Death of Superman and all the stuff that came afterwards. That was one of the best super hero comic I have ever read, because we all know Watchmen is the greatest super hero comic! Yay! Someone without an atiquated and misinformed view of the Man of Steel! Also, I fixed that for ya ;). Well, at least your antiquated view doesnt mean you dont like him ;). Seriosuly though, Superman is not indestructable, just highly durable. If his fights with Darksied, Doomsday, or a variety of over-powered baddied he has fought (You know who you are Anti-Monitor! ), has taught us anything other than how powerful the villans are, it's that he isnt indestructable. Also, Superman cant fit in a dark gritty atmosphere, unless that atmosphere is Apokalips, or unless he's in that atmosphere to try and give it some Blue Boy-scouted hope, or in an epic fight that causes much of the city to be destroyed, and some of his loved ones. I don't really count The Watchmen as a proper Super Hero comic. But as a comic, yes it is above the Death and Return. But then I'd like to go a step further and put V for Vendetta and The Sandman on top of those two. I hate Superman for other reasons, if that makes you happier? I just figured that the Kryptonite reason was the most mainstream and therefore the one that most people could relate to when I said I didn't like him. I don't really count The Watchmen as a proper Super Hero comic. But as a comic, yes it is above the Death and Return. But then I'd like to go a step further and put V for Vendetta and The Sandman as awesome as Watchmen, and in no ways exceding it, but then again, still being equal to it. No applause, no applause, just throw money. I knew there was something wrong with that man. That poor, poor boy. I myself rather enjoy Superman Returns, and I am quite eager to see what the daring duo of Christopher Nolan and David S. Goyer can do with the franchise. I wouldn't mind if they found someone to play Lois Lane who didn't look like she was fresh from 90210 or Bring It On. But that's the old fart in me talking. On an additional thought: I realize the guy already has a lot on his plate, but dontcha think Zach Quinto would make a good Supes? At least you responded to it better than some person who's a so called legend around here. And for that, I commend you Glenrath. Now, about that Faux News webcomic idea you NEVER responded to that I sent! It's a matter of iconism. When a random person is asked "Name a Superman villian" odds are that they'll name Lex Luthor. Think about the Batman Reboot for a second: They tried first in Begins with Raj-al-Ghol (or however you spell his name) and the Scarecrow with a modicum of success. Christian Bale was the new Dark Knight; Michael Cane and Gary Oldman were the new Alfred and Jim Gordan; Morgan Freeman was the new Lucius Fox; and Gotham was turned from the near-cartoonish world of the 90s franchise into the dark, gritty realism of the new series that could only be done in Chicago. That said, the movie really doesn't stand out on it's own in comparison to The Dark Knight. In fact, it feels more like a prequel to The Dark Knight, establishing the majority of backstory for Bruce Wayne, Jim Gordan, and the Batman mythos (the suit, cave, Batsignal, Batmobile, etc. ), hammering out the tragic love interest in Rachel Dawes, explaining how the Joker and other future villians first appeared, and set-up the power vaccume left by the Falcone bust. Hell, even "Begins" in the title is usually reserved for prequels, not the first movie. The Joker, the iconic Batman villian whether your a fan or not, is what set apart The Dark Knight from any other superhero movie in history and will likely be the mark for best villian for decades. This is made almost more ledgendary by the fact that Heath Ledger will (tradgically) not be able to play the character in any later sequel, so the character won't be breaking out of Arkham any time soon. In a superhero movie, it is the antagonist on the other end of the fight that truly determines whether a film is a success or not. The Lex Luthor that will be in the new movie will definately be far from the Lex Luthor from the old movies (of which I count Returns). We'll see probably a multi-facseted CEO who "staved the recession through 'solid business practices'" such as maintaining a privately-owned corporation (i.e. no hand in the NYSE) and having a diverse portfolio of industry (think GE). Luthor will probably be less of a straight up villian, but more of the guy who sells his arms to less-than-savory people and gets connected to it via a story by Clark Kent or Lois Lane after an Superman-involved incident in Metropolis. He'll hire a hitman who fails (unless they try something more interesting and have him succeed, which would be even better if Lois Lane is the one killed, sparking a Superman revenge plot) and gets tied to Luthor again. One thing leads to another, but in the end, Luthor will probably have nothing more than a quiet conversation with the Man of Steel and Superman will be forced to back off after reaching a tenuous agreement where each agrees to avoid crossing each other's path. The last image of Luthor will be him sitting at his desk hand resting on his chin pondering his next move, possibly with a smile depending on how the conversation turned out. If they try a Dark Knight-style movie, it will be far from a happy-ending in the same vein. And, depending on the economy at the time, it would directly relate to the feelings of the audience, where men who commit horible acts within the law are esentially protected while the rest suffer the consequences. This could be a working story. This is what they should have done in the first place. Although I did find a few parts of Superman Returns to be good, as a whole I felt as if the movie was cheating me. Brandon Routh didn't feel like Superman or Clark Kent, he felt like Christopher Reeve. Regardless of how well Reeve did and how much he was liked in the past, it wasn't fair to the character to base the film on him. I'm not too sure about taking the character down a "darker" path but I'll take it if its a truly new path. My problem with the Superman franchise is Superman himself (indestructible, overpowered, no character flaws: Zzzzzz). I don't personally see how drafting in the Dark Knight team can really help Superman beyond helping it to fit in the same stylistic "universe" as Nolan's Batman. Lex Luthor may be the iconic villain for Superman but He's also the most over-played, it's entirely possible to make a Superman film without him being in it. Why not Darkseid or Bizarro Superman? Hell why not make Batman be the main villain, they have fought before on several occasions. Every Superman film to date has been a variation on a theme, each one with diminishing returns. For the love of god i hope they make him fight Doomsday or Darkseid. Superman is the greatest superhero ever, he deserves an awesome movie. With due respect, you're in the minority. The Burton Batman (Batman Returns, for those who forgot about it) was probably the turning point in the 90s series, where more cartoony elements were implemented which likely lead to the less-than-steller Batman Forever and the down-right awful Batman & Robin. It was a good movie for those of us who like Tim Burton's style of directing, but it essentially turned the series into a joke. While the idea of having another villian instead of Lex Luthor is a tantalizing idea, no producer in their right mind would give it the go-ahead as the first movie. It's not a matter of originality or desire to branch out into the Superman cannon; it's a matter of money. In order for the reboot to succeed, the film must make at least a few buckets of money to take home to the studio and say "See? it worked!" As a result, they have to use the winning style of The Dark Knight with realism and a solid guy they can have as the antagonist. Darkseid's an alien, which would require too much backstory to fit in a first movie. In addition, he doesn't resinate much outside the circles of "guys who know about Superman." Bizzaro Superman has similar problems and it would be a bit clunky to implement. Batman's a good guy, even if he's running from police now, and general audiences don't quite process a good-guy vs. good-guy plot in the same way that comic book fans do. What worked for Alien VS Preditor and Freddy VS Jason is not going to work for a Superman/Batman crossover. Again, which is why a reboot has to work or the IP will be untouchible for a generation... again.